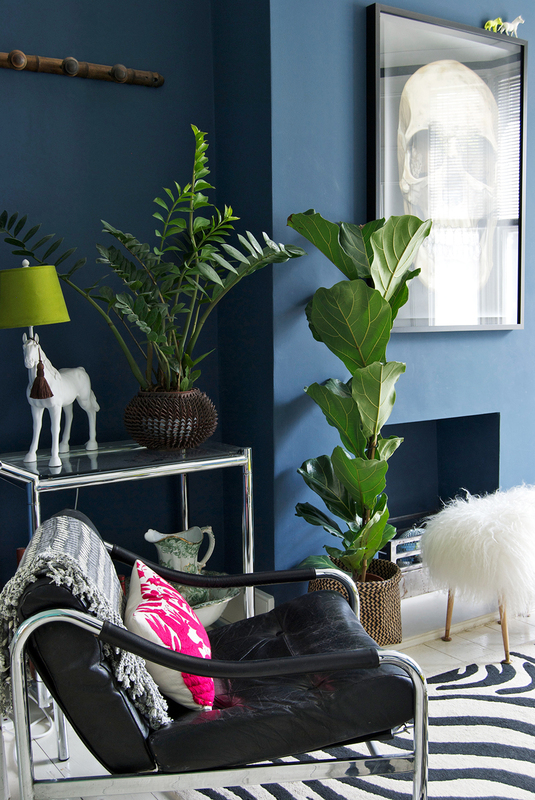 Sometimes I get a bit overwhelmed in the lead-up to redecorating a room - my mind goes into overdrive thinking about the look I'd like to achieve, and a gazillion and one ideas pop in (and out) of my head. I'm great at visualising how something will look, but I also change my mind. A lot. So I find that I need to gather my thoughts and get them out of my head and onto paper (well, not always paper, but onto a screen, or sometimes both), and the best way to do that is to create a moodboard. For me, it's the best way to see how everything will work together, what might be missing, or what needs to go. If you follow me on Instagram or Twitter, you will know that I'm ALWAYS planning to redecorate a room of our house. It never ends. At the moment, I'm working on ideas for the main bathroom, and our adjoining living and dining rooms. And in the back of my mind, ideas for Edie's room (which is also on the list) are also brewing. Oh and then there's my studio which is less than pretty, that could do with some attention too. The bathroom is a big job, and one I don't particularly have the headspace for at the moment, or this year even, but the living and dining rooms, which make up our main living area, have jumped to the top of the list. Oh, and finishing decorating the hallway and stairwell. Then there are the half finished lamps I need to re-spray, and the chair that needs stripping, repainting and re-upholstering, the coffee table that's to be repurposed as a bench seat, and the list goes on and on. So much going on in my head that I actually feel anxious about it sometimes, even though there are no deadlines, and the only people that need to like it are me and my family. Silly to feel anxious about it then I know, but it's true. I do tend to put a lot of unnecessary pressure on myself - I know that I need to get over it and remember it's just paint and stuff. And it's not like I can't change it again, right? Right. 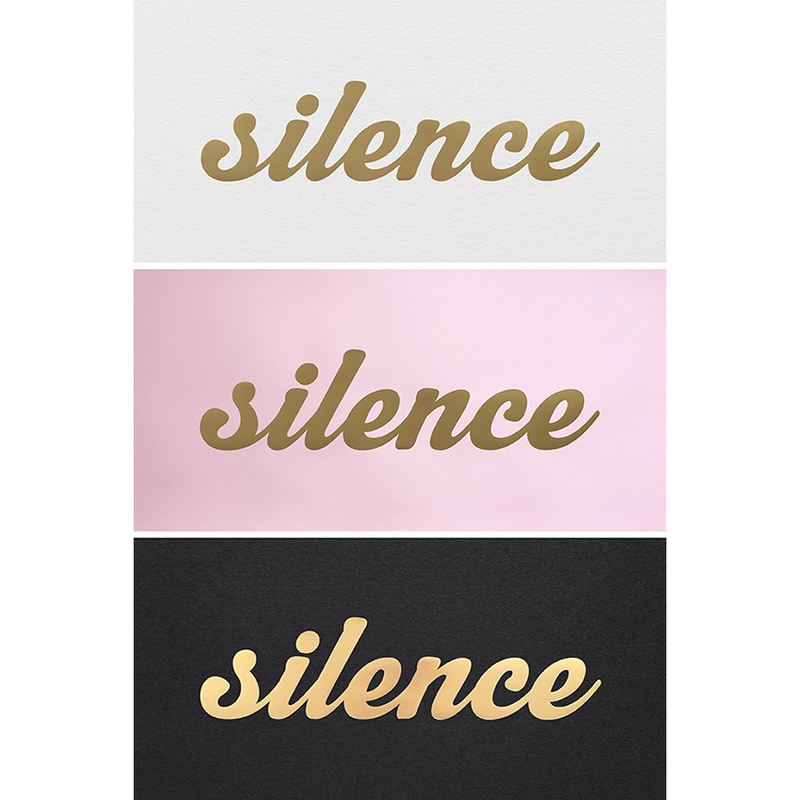 That said, I feel my mind getting quieter and more relaxed as soon as a moodboard starts coming together, which I love. Then I know I'm heading in the right direction, and that as we already know, everything will be okay. Great even. And exciting. I'm going to focus on just the living room in this post, otherwise it will go on for days, so we'll look at my plans for the dining room next time. It looked great didn't it?! So WHY ON EARTH am I changing it??! Well, I get bored easily and the paint was starting to look a little worse for wear - it needed to be re-done and I'm not one for painting a room the same colour twice. I thrive on change, and once I get a 'I feel like a change' bee in my bonnet, there's no stopping me. What we often forget when we're bombarded with images of beautiful rooms that look amazing on a screen or in a magazine, is how a colour makes you feel when you're physically in that room. 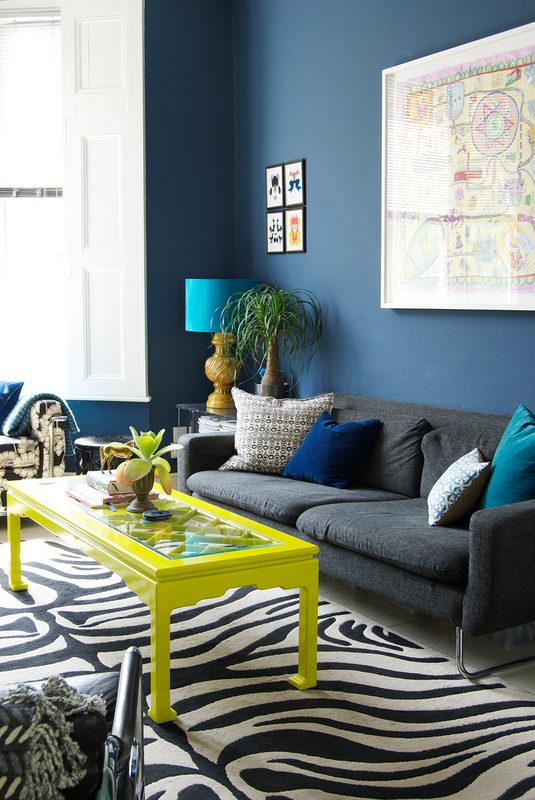 It's all very well loving a colour in a picture, but will you love the way it makes you feel when it's in your home? I realised that even though I LOVED the way the navy looked, I mean it photographed beautifully right? BUT I didn't love the way it made me feel. For whatever reason, it just wasn't working for me, and so, it was time to lighten up again. I should add that I know changing the wall colour is a big deal to some people, especially if DIY is not your thing, it can be quite costly. For me, it's the price of a can of paint or two and my time, so perhaps I can justify changing my mind every two years a little easier. Unlike, kittens and puppies, paint is not forever! My objectives are to make the room feel cosy, but light and airy at the same time. And calm. I feel like I need calmness and serenity in this room that we spend so much time in as a rowdy family of four. Most importantly, I need to achieve this without stripping out the personality. Oh, and I don't really have a budget for this, so I'll be searching for bargains and moving lots of art around from other parts of the house. So, what colour have I chosen for the walls? No, I haven't painted it white - don't be silly! The easy choice would have been to go for a mid to pale grey, and very nearly did. But although I love, it seems too easy a choice, and it's been done to death. Of course there's nothing at all wrong with that but I just I want it to feel fresh, and I keep being drawn to fawns and fleshy tones, so that's where I headed. I was VERY surprised when Setting Plaster by Farrow and Ball got the thumbs up from the entire family. Just don't call it pink! However, in the slightly darker adjoining dining room, it was a bit too dark and salmony for my liking, so I went back to the drawing board. Again. Pink Ground won in the end - it's quite a bit lighter, less brown and more yellow, and okay, let's just say it - more PINK than Setting Plaster, but still more fleshy than sugary, especially in the darker dining room. It's actually surprising neutral, and yeah, I love it, so a few weeks ago I started the transformation by painting over that navy blue. Not as big a chore as I feared - one coat of high opacity undercoat and two coats of Pink Ground and voila! It's as if it was never there. Stripping out that strong colour and replacing it with something so much lighter and softer has already transformed the room, but it's far from finished. I need to source a rug (or possibly two to layer) that will add some warmth and texture, to replace the rowdy (and pretty knackered) zebra print rug. It will need to hide the sins of a family who tend to eat in front of the television a fair bit on the weekends. So texture and a darkish colour will be perfect. I'll add some fun back in with new cushions - some leopard print ones that I'll make from the House of Hackney velvet I picked up at their recent sample sale, teamed with some of my own designs but sticking with quite a neutral palette of browns, blacks, taupes, golds and white. 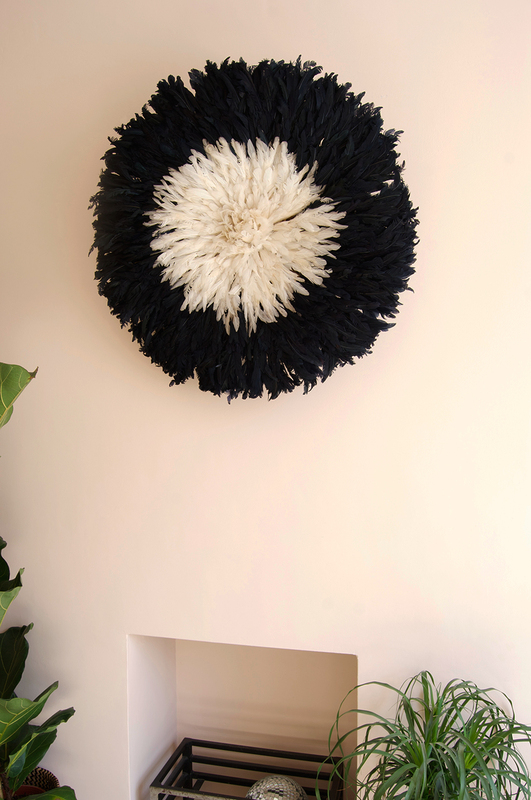 I'm going to keep the artwork pretty monochrome - by moving the framed Grayson Perry scarf currently above the sofa into the dining room, and hanging my beautiful new Juju Hat. 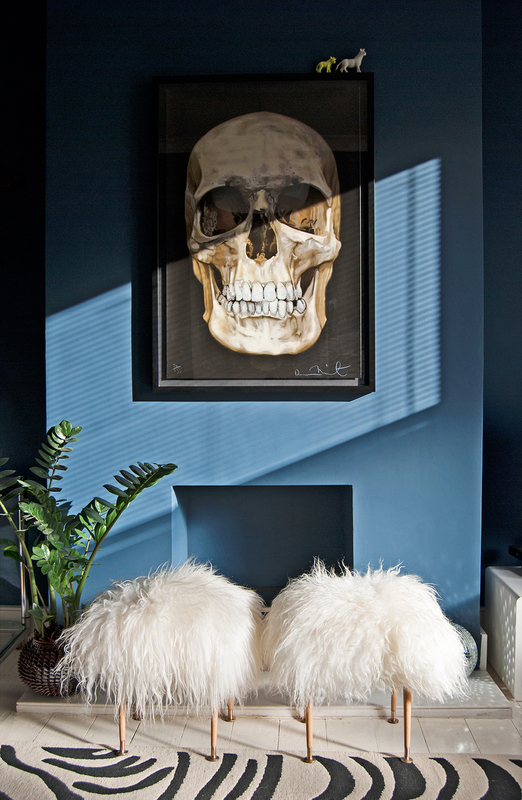 I'll also pinch some monochrome art from elsewhere in the house to complement the existing Damien Hirst skull print, that will stay on the chimney breast. 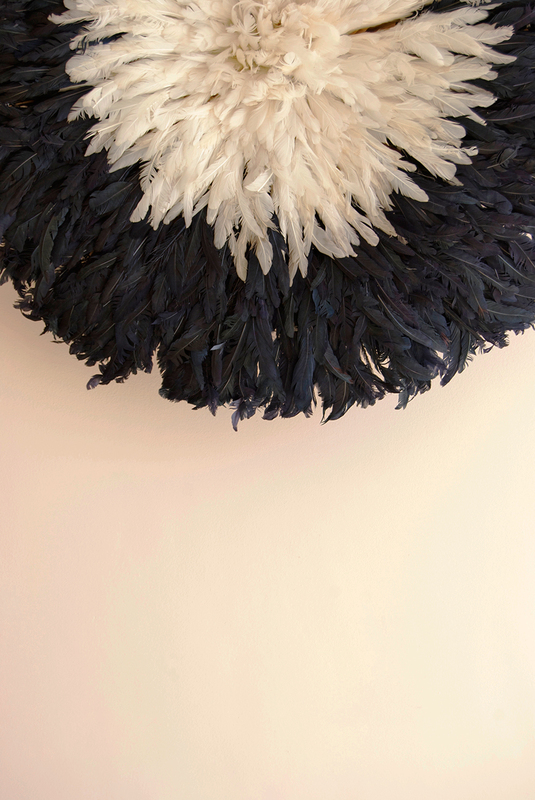 Adding some pops of gold in the form of a vintage coffee table, West Elm side table and possibly a new lamp will add a bit of glamour, and contrast nicely with the textures of the feathers in the Juju Hat, the rugs and wicker pieces I also plan to add. 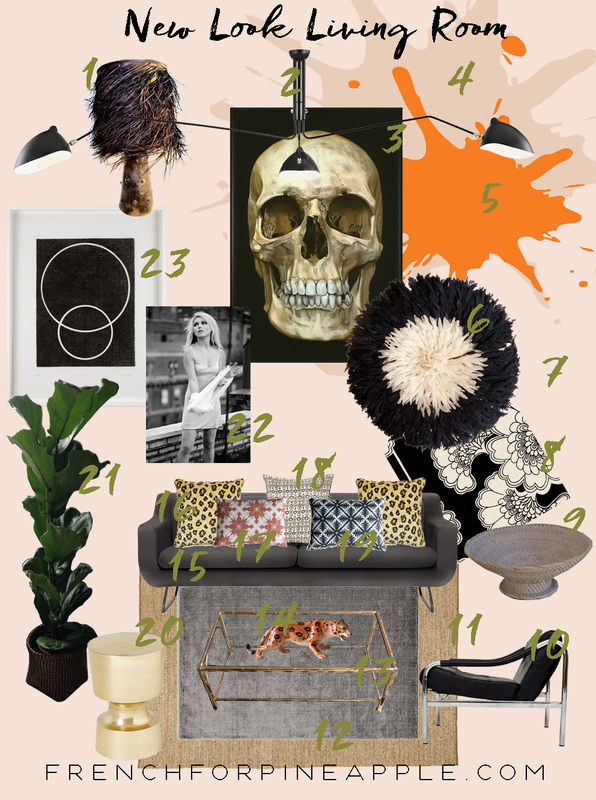 Here's the moodboard as it stands today. It has changed several times since I started writing this post, and it probably will again before I finish the room, but that's part of the fun, and if you're immovable on your original ideas, your end result won't be a natural one (and it will show). 1. Shaggy Palm Lamp - Abigail Ahern. A bit of a fantasy inclusion, but man I love this lamp! 2. Serge Mouille inspired light fitting. 3. Damien Hirst 'Skull Beneath The Skin' Screen Print - for similar try Paul Stolper. 4. Setting Plaster by Farrow and Ball - may use this on the built in storage. 5. Charlotte's Locks by Farrow and Ball - another accent colour, but for something smaller like leather mats for the top of the built in cupboards (love this idea borrowed from my clever friend Kate!). A year ago I would NEVER have considered orange anything, but I love it against the wall colour! 6. Juju Hat. Mine was an ebay bargain but you can get one from Rockett St George. 7. Pink Ground by Farrow and Ball - aka The Wall Colour. 8. Florence Broadhurst Fabric (which covers an existing small sofa) - Liberty. 9. Footed basket - La Galeria Elefante. 10. Pieff Alpha Chair - vintage from ebay. 11. Sinnerlig Seagrass Rug - Ilse Crawford for Ikea. 12. Oceans Rug - Plantation Rug Company. 13. 70's gold and glass coffee table - vintage from ebay. 14. Ceramic Leopard - vintage from ebay. 15. Aspen sofa Content by Conran. 16. Leonine Cushion - House of Hackney. 17. Maui Cushion in Mink - Bianca Hall (yeah, that's me). 18. Antibes Cushion in Mink - OKA. 19. 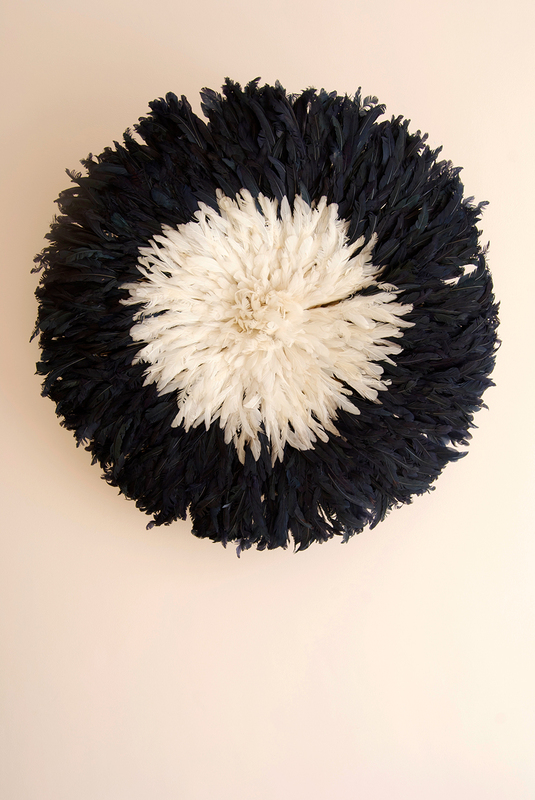 Bahia Cushion in Charcoal - Bianca Hall (yep, me again). 20. 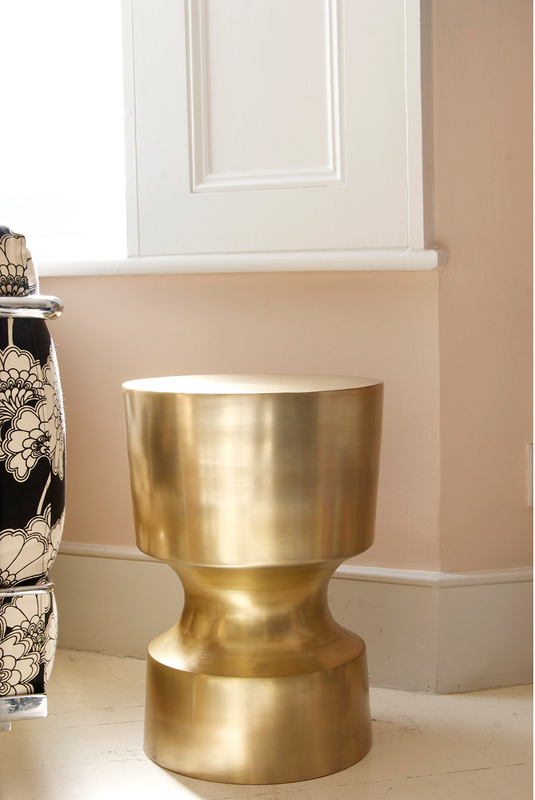 Tumbler Side Table In Brass - West Elm. 21. Fiddle Leaf Fig - mine was from Angel Flowers in Islington but you can buy one here. 22. Debbie Harry Photographic Print by Kate Simon - try Rock Archive for similar. 23. Keith Coventy Etching - try Paul Stolper for similar. One major thing that needs to be addressed in this room is the alcoves and lack of storage. I never post any pictures of the television side of the chimney breast because it's plain old awful. I promise when this room is properly finished, that I will post ALL the before and after shots too - including this less that photogenic area that has been a bug-bear for years. I have finally decided to stop searching for the perfect vintage pieces as I want the alcoves to match and I'm now waiting on quotes for some bespoke cupboards and shelving, which really is the best option, though it won't be cheap. A lot will be staying the same - the grey sofa, the small sofa covered in Florence Broadhurst fabric, the lucite side table, the It stools and the vintage leather chair. I will need to sell my 70's chrome trolley to make room the built in storage, and the chartreuse coffee table that's in the before images above is going to be repurposed into a bench seat for our bedroom. Yes. The same coffee table I bought and painted just before Christmas last year. I chose the wrong colour, which I could fix easily enough, but what I didn't anticipate was that every time one of the kids spills their water/maple syrup/milk on it (so that's every day), that before I can wipe it up, it would seep under the glass and ruin the paint job. Nope, didn't see that one coming. Other bits that need sorting are the blinds - I was waiting until I'd painted to decide on these and I've decided to go with simple semi-sheer black roller blinds. Anything will be a vast improvement on the awful bent/filthy/dust collecting silver venetians that needed to be replaced seven years ago, and somehow have survived my critical eye all this time. The floors desperately need a repaint (in lieu of me finding a spare six grand to install parquet! You can see my freshly painted hall floor here). I still really really want a huge fiddle leaf fig. I have a plant already, but I really want a big tree. Maybe this year will be the year - an early Christmas present to myself perhaps. I adore the natural greens of plants against the fleshy pink of Pink Ground, so yeah, more plants. So it's a work in progress - a few things are done and purchased already and later this week I'll make a decision on rugs and purchase those. I hope to have this room finished other than the alcove storage in a few weeks time, so I'll share my progress with you as soon as possible. A big fat gold star for you for making it this far. I know I'm exhausted after this mammoth post. 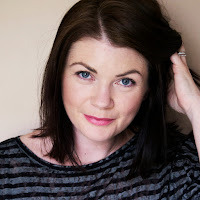 By the way, I've been nominated for an Amara Interior Blog Award in the Best Newcomer category. So if you like my blog, I'd really like your vote! You can do that right here, and I promise it only takes a minute, AND you'll be in with a chance to win a holiday too! Check out my Pinterest boards for more inspiration too!